I've read several biographies of the great editorial cartoonist Thomas Nast, and I've read a history of Boss Tweed's Tammany Hall ring, but what I've long pined for, and considered the most perfectly natural idea for a book, is a history of the Tweed ring as told through Nast's cartoons. Finally such a book was written, and unfortunately has managed to fly under my radar for over five years. Well, better late than never, I did finally stumble upon it recently, and I'm delighted to say that the book is pretty much everything I could have hoped for. John Adler navigated through a minefield of potential pitfalls to produce this book, which I consider just about as close to a perfect treatment of the subject as possible. He could easily have gotten bogged down trying to provide a thorough biography of Thomas Nast or Boss Tweed, or offered an exhaustive history of the deeds of Tammany. He resists those temptations, though, and confines himself to guiding us through the entire amazing episode via Nast's incredibly powerful cartoons. He explains all the nuances of what is depicted, and gives us enough of the history and biography of the personages involved to understand the enormity of the events and the genius of Nast's response. It's a masterful piece of work, and Adler, with the expertise of cartooning scholar Draper Hill guiding him, deserve a much wider readership than, as best I can tell, they have gotten. These are the most important cartoons ever drawn; I can't even imagine that blunt statement garnering even a whisper of debate. So if you are seriously interested in cartooning, this book is not really optional in your library. It is basically a Cartooning Scripture, explaining how it was In The Beginning. 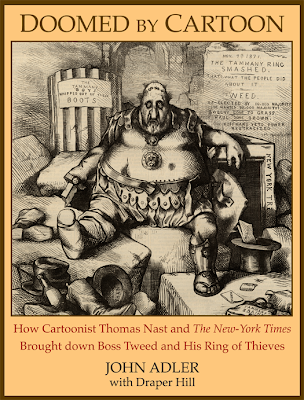 For without Nast, and without Tweed, and the explosive confluence of those two mighty forces, cartoons may never have become synonymous with American journalism, and everything that followed may have changed course in unknowable ways. I bring up a few minor negative points only because I'd love to see an even better second edition someday. The layout and design of the book was obviously handled by loving but not always highly accomplished hands. Among other layout problems, the cramped margins and large blocks of whitespace are a trivial annoyance, but they are an annoyance. The other problem is not so easily corrected. It's a complication that has confounded every book designer when confronted with Nast's cartoons. His large double-truck cartoons, often full of important small details, are all but impossible to appreciate at the size they are reproduced. This book does an admirable job of mitigating the problem in some cases, by blowing up important vignettes for closer inspection. However, it would be ideal if the large cartoons were reproduced at close to original printed size. This would either take a skillful book designer, who could reproduce the double-trucks in their original form (though they would still have to be reduced a bit), or an extravagant budget would have to be allowed for fold-out cartoons. It's probably a pipe dream, but if Nast doesn't deserve the royal treatment, who does? Are there any publishers listening? Agreed, they should be reprinted in a larger format, perhaps like the Little Nemo "So Many Splendid Sundays." Now that I'm sitting down with it, my summary would be that it comes across like a thorough and exhaustive guide for somebody who has access to the real thing rather than the fair facsimile of the real thing hat it could easily have been. All the pictures are here. A few minutes in photoshop could have made each one look clean and sharp.